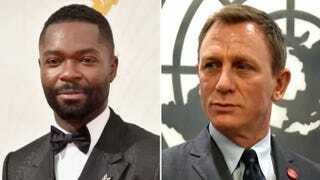 A new production of Shakespeare's Othello has two of Hollywood's biggest heavy hitters in leading roles: David Oyelowo will play the Moor, Othello, who gets betrayed by his jealous friend, Iago, who will be played by fellow Brit Daniel Craig. The play will be an off-Broadway production put on by the New York Theater Workshop, the New York Times reports. The show will run in fall 2016. Oyelowo's career skyrocketed after a meaty role in Red Tails, where he played a Tuskegee Airman, and then in Selma, where he played the iconic Martin Luther King Jr. Craig is the current face of the James Bond franchise. It'll be great to see both men go head-to-head in this play and to see how they'll infuse their own idiosyncrasies into these historic roles. I wonder who'll play Desdemona?